Back pain may be the result of a serious injury such as a vertebral fracture, ruptured disk, or arthritis, or might be the result of an injury to a muscle or ligament. 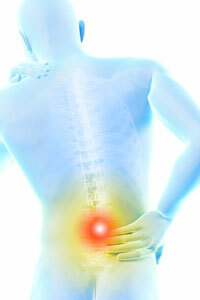 The resulting back pain can range from excruciatingly painful and disabling to being a constant annoyance. Contact us to learn about the options for successful treatment of your pain condition. Call us to find out about your options for treatment of your pain condition. Symptoms of back pain can run the gamut from severe to mild including aching muscles, shooting or stabbing pain sensations, limited flexibility and extreme stiffness, to radiating pain running down the legs or the inability to stand upright with correct posture. Back pain symptoms may include feelings of muscle ache, stabbing or shooting pain, stiff or limited flexibility in the back, inability to stand with proper posture and radiating the pain down one or both legs. Although discomfort from lower back pain is a very common condition, its symptoms and the levels of pain it creates vary widely. Our main objective is to determine the source of origin of your pain! The diverse characteristics of back pain can range from a simple strain that brings about an emergency room visit due to excruciating pain or to mild aggravation and intermittent discomfort due to a degenerating disc. Degenerative Disc Disease, Herniated Disc, Radiculopathy, Pinched Nerve, Spinal Stenosis Spondylosis, Arthritis, or Vertebral Compression Fracture. The first step is gaining effective relief is to clearly identify the symptoms and accurately diagnose the specific cause of pain at the root. At the Pain Management Center, our Board Certified Specialists are well versed in identifying the exact cause of your low back pain. Additionally, they will first seek to provide effective non-surgical treatments. Our highly experienced team of qualified specialists at the Pain Management Center, located in Queens, N.Y., are experts in discovering the root causes of pain symptoms, determining conclusions and then employing the latest treatment techniques through pain-free, safe, and nonsurgical therapy options. At Pain Clinic NYC in Queens, we have a team of experienced specialists who diagnose the root cause of the problem through latest techniques and employs safe, pain free & nonsurgical therapies, accordingly. We take great pride in providing both affordable and the most advanced treatment therapies available to enable our valued patients to lead a healthy and pain-free lifestyle. To achieve our goals we utilize an array of multidisciplinary approaches to help our patients to return leading normal lives without the former pain.